Andy Ockershausen:	This is Andy Ockershausen, and this is Our Town. I have absolute so much delight to welcome a dear friend, a very, very important banker, but more than that, one of the great citizens of Our Town, Ron Paul. Ron has been an amazing man at what he has built in an empire in banking. He did it in real estate also, but then what he’s done for the community is unbelievable. The number of places his impact is felt is continuing and he’s been the Chair of the National Kidney Foundation, which is his labor of love I’m sure, along with his wife. They have made it such a very important part of George Washington University. So welcome, Ron Paul, to Our Town. We’re so delighted that you could do this and I’m gonna ask you a lot of important questions. Ron Paul:	Good morning, Andy. Thank you. Thank you for having me. Andy Ockershausen:	I mean just all from one office. But you planned it. Ron Paul:	It just goes to show that our community is desperately in need of relationships and continuing to build relationships and continuing to want to build relationships and even the millennials that we’re finding more and more, are now starting to get the feel of the way we grew up, based on relationships that they need those relationships. Andy Ockershausen:	Connecting the dots, Ron. Ron Paul:	Exactly. That’s just what’s really cool, so it’s really cool that we spend a lot of time talking to the millennials, explaining to them what they need to build relationships, and it’s really evolved. Andy Ockershausen:	And you’ve done wonders with it. One of the things that impressed me … You’re a New Yorker from Oceanside. Is that on the bay or is it on the river, is it in Montauk? Where is Oceanside? Ron Paul:	… on the South Shore right by the Nathan’s that serves hotdogs. Andy Ockershausen:	On the South Shore. Ron Paul:	The South Shore. Andy Ockershausen:	I love that part. I had two sisters that lived and married New Yorkers and lived up there. I spent some time along the beach, and I love Long Island. I love everything about it. Andy Ockershausen:	Why go to the University of Maryland? Ron Paul:	… way before Monday Night Football, way before Monday Night Football. Every Monday night they used to have the New York Giants, they used to come to the Nathan’s there and talk to the kids. So we used to have Spider Lockharts and Allie Shermans … That was a real treat going with my dad that Monday night, so talk about the Redskins all the time. Andy Ockershausen:	But Nathan’s Hotdogs? I mean that’s a one – I took Janice one time, for Nathan’s Hotdog, to that place to show her because she is a local girl and she’s in the know about Nathan’s and knew about the beach, but it’s such a bigger part of New York life now, is Coney Island and the hotdogs and Oceanside, and Monday nights, huh? It grew into a part of our lives. Ron Paul:	You talk about watching New York Giants football and having hotdogs and french fries at Nathan’s with your dad and nothing better. Nothing better. Ron Paul:	Great memories, great memories. Andy Ockershausen:	Great part of New York. Andy Ockershausen:	But of course the University of Maryland couldn’t offer anything like that, expect was it an accounting school you picked Maryland? Ron Paul:	I did. I decided that I wanted to go to University of Maryland, wanted to be in the area, and chose Maryland. Absolutely loved it, it wasn’t difficult for me to get into the school, it was difficult for me to find housing. Ron Paul:	That was the key. Andy Ockershausen:	I can tell you the fact that I could never get into school now. It’s too tough. They have really improved academically. Obviously, Pincus couldn’t get in this school either. Ron Paul:	Oh, no question about that. Andy Ockershausen:	Bobby. He’s a very dear friend as you know, and has been a very important part of my life and the life of our community and when we did so many things together, and nothing compares to what you’ve done, Ron, by being in all these organizations, you lend some credibility and being a banker you could help em with their fiscal problems. Andy Ockershausen:	At Cole Field House? Ron Paul:	… which ultimately I did about a year and a half later after Joy and I moved back to New York for a little bit, and then moved back down here in 1980 and became a bookkeeper for his real estate company. Andy Ockershausen:	But that is a great way to learn the real estate business, correct? Being a bookkeeper. Ron Paul:	Great way, great way. I understood income-producing properties, which is what he specialized in, by understanding the accounting side. Andy Ockershausen:	Did you specialize in buildings, or I mean real estate for individuals of a buildings, or companies? What was the specialty here at that time? Ron Paul:	His specialty really was multi-family apartment buildings and condos, so I got to understand that side of the income-producing properties on apartment buildings, and really continued that throughout the rest of my career in the real estate business. We mainly have office buildings and apartment buildings. Andy Ockershausen:	Yeah, before you got into the banking business, you had your own real estate company, correct? Ron Paul:	That’s right. I moved down here in 1980 as a bookkeeper for him. Unfortunately, he passed away two years later. Ron Paul:	In 1982 was not a very good time to be in the real estate business. Interest rates were 20%, it was a terrible time, so I started my own company cause I had nothing else to do, and just really started my real estate business in 1982 and continued it to this day. Andy Ockershausen:	Just exploded! You hit the market at the right place. Montgomery County, well everything’s exploded in this Metro area. Our Town has just grown in leaps and bounds. 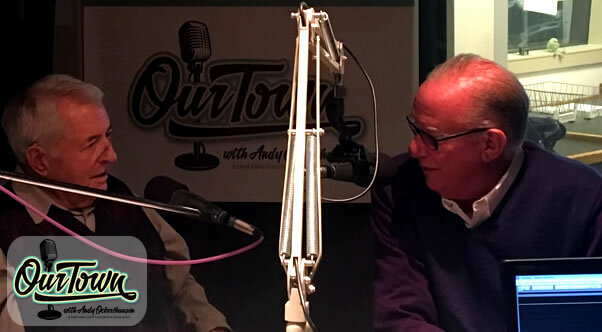 We had the opportunity yesterday to speak with Arthur Cotton Moore, the great architect, and the things he’s done and what he offered to Our Town, but to think about how we’ve grown Ron, and you’ve been a big part of that growth. Ron Paul:	Well it’s just a wonderful town. I remember moving down here in 1980, and I remember going to listen to a speaker from a national brokerage firm who really said that he thought, and this is probably in the mid-80’s, that he thought that Washington was gonna get more like New York, not New York to become more like Washington, and boy is that the truth. Ron Paul:	What we have here, between theater and restaurants and community and Millennials and activity, and now all the things going on downtown, is just phenomenal. Just . . .
Andy Ockershausen:	… call us the Little Apple, huh? Ron Paul:	Well, I don’t know. We’ve got our own brand. Andy Ockershausen:	We do that, and what’s happened … You talk about downtown, and in the banking business, have been an opportunity for you to expand, you’ve taken advantage of what the growth … Not only did you cause it, you’ve taken advantage of it, by putting your branches out there. Ron Paul:	Well one nice thing is, is that our bank is made up of directors and employees that really understand the market, and therefore while Washington is a great town, there’s sub-pockets of Washington that you really gotta get to know. We’ve been fortunate enough to have the people that are on our Board that understand that and be able to put our branches and put our activity and put our money and put the development money towards those particular areas, and that’s what’s worked out so well, but the entire city is just gone crazy. Andy Ockershausen:	And there’s no stopping it. Ron Paul:	There’s no stopping it. We’re not short of restaurants, that’s for sure. Andy Ockershausen:	Our Town. Got restaurants, bars, and very good theater now. We’re gonna take a break right now. I’m talking to Ron Paul. This is Our Town with Andy Ockershausen. Andy Ockershausen:	This is Andy Ockershausen, and Our Town, and talking with Ron Paul about his activities, extra-curricular for being a banker and a builder and a real estate man, and an accountant. Andy Ockershausen:	The GW Ron and Joy Paul Kidney Center have launched a series of ads featuring James Brown, JB, the famous NFL Today star to me, is an awareness campaign that aims to educate citizens in the DC market about kidney disease. Ron, this campaign has been so successful in getting attention, and that’s what you had to do cause you had sort of a problem here. You had a problem with the kidney disease, but not many people were doing anything about it. Ron Paul:	Yeah, back in … I was 26 years old, healthy, active, golf, working 20 hours a day and decided it was appropriate for me to get a life insurance test. Took a life insurance test and failed, and nobody could believe that I could possibly fail. How could I possibly fail at 26 years old, healthy? Turns out I took it again and failed, and I had kidney failure. Andy Ockershausen:	And you didn’t know it. Ron Paul:	And I didn’t know it. Didn’t know it, and had two little children at the time and it was a really eye-opening experience. Andy Ockershausen:	26 years old! Ron Paul:	Fast-forward and my brother Steven donated the kidney in 1990. Fast-forward in 2009, the CFO of my real estate company and dear, dear, dear friend Kathleen McCallum donated my second kidney. Ron Paul:	Prevention. Prevention awareness, and they can do something about it. Andy Ockershausen:	Pretty much average? Ron Paul:	… to the Washington metropolitan area, its eating habits, Diabetes is the number one cause of kidney failure in the country, and so obviously eating habits is a very big part of kidney disease. Joy and I made the decision along with GW University that we had to go get ahead of the curve and be able to go out and promote and we meet with hundreds and hundreds and hundreds of people on a regular basis, asking them to go get blood work, go get urine tests and see if you have kidney disease because so much of it can be prevented. Andy Ockershausen:	Wow! And you think that this is a socio-economic problem? Is it a high-income group or low-income group or is it pretty much in the middle, this kidney problem? Andy Ockershausen:	… has to do with diet, of course. Ron Paul:	… but I borrowed two from very dear people. Andy Ockershausen:	And very important to you, obviously. Ron Paul:	… of the Kidney Foundation. Andy Ockershausen:	And JB is so well-respected for so many reasons and as I told you, my encounter with him goes way back when he worked for Xerox, but I remember when he went to school at DeMatha of course, and he was always a good citizen and I told him he should be in radio. He’s got a magnificent voice. It sounded so good to me, and I said, “You know JB, you got a face for radio.” He didn’t laugh at the time. Now every time he sees me, we talk about it, but you were able to enlist him … He means so much to the community and yet he’s got that same pull. He can bring people to you. Andy Ockershausen:	Why did you pick George Washington, or did they pick you? Ron Paul:	Yeah. A very dear friend of mine was head of the National Kidney Foundation and retired, and he and I and a doctor friend of his got together and played golf, and little did I know that he ultimately was gonna run the transplant clinic over at GW. So literally over a couple beers after a round of golf, we put the whole deal together. Like they say, deals on done on a golf course. It’s just been great. Ron Paul:	Keith Melancon is the doctor’s name. He’s an absolutely brilliant, brilliant guy. Tony Englert, who was the head of the Kidney Foundation and now head of the GW Kidney Center, and we’re just out there constantly telling people to just be ahead of the curve. Andy Ockershausen:	Prevention, prevention, prevention. Ron Paul:	You got it. You got it. Andy Ockershausen:	Gotta stay on that all the time. Ron Paul:	Unfortunately it’s not getting better, it’s getting worse because our days are so hectic and food is becoming just too easy to … Here’s 10 bucks and just go to a quick carry-out, and that’s what’s hurting our kids. Andy Ockershausen:	In the lower socio-economic community it’s such a problem to overcome that, because their convenience costs them a lot of money, rather than shopping at a Giant or a Safeway, they go to the 7/11. Andy Ockershausen:	It’s just a killer. Ron Paul:	It’s a killer, and it’s not needed. There’s medications out there to help you. Andy Ockershausen:	They can help. Andy Ockershausen:	We got to be very friendly over the years with Steve Trachtenberg, who did a marvelous job with the University. That building program that they put on and everything, it’s such a great part of Our Town, George Washington. Ron Paul:	Steve was just a game-changer at GW. Andy Ockershausen:	Oh, wasn’t he something else? A real fire plug. Ron Paul:	And I must tell you that Kim Russo, President of the University Hospital now, is just a rockstar as well. Kim has just done an amazing job in making people aware of what all the different programs GW has to offer. Andy Ockershausen:	GW, and the location is location, location, and I noticed that over the years cause I’ve been riding through that campus forever, it’s spread out so much now. They have buildings all up and down 21st Street and all up around Pennsylvania Avenue, I mean they’ve taken over apartment houses, they’ve done a wonderful job to make it a real city University. Ron Paul:	… you think that’s 90 lives that changed, Andy. I mean 90 lives that we’ve given back, and that is just about as gratifying as it comes. Andy Ockershausen:	And that’s just the beginning, too. Ron Paul:	Just the beginning. Andy Ockershausen:	It’ll continue to grow. Andy Ockershausen:	Well, Joy is obviously into this as deeply as you are. Andy Ockershausen:	Can’t do it without her, you know that. Ron Paul:	Joy says, “Get out of the house.” So what do we do? Joy and I both go and volunteer down at the kidney center. Joy was just down for the Health Fair that we were out promoting the kidney center, and it’s just it’s a gratifying feeling. Andy Ockershausen:	You get a lot of out of that, absolutely. Ron Paul:	I can’t tell you. Just a real quick story. I got a phone call from somebody I didn’t – I knew the name, couldn’t place the name, pick up the phone, say, “Hello?” Guy’s name was David. Picked up the phone and little did I know it was a guy that I knew from elementary school. Andy Ockershausen:	Oh, my gosh. Ron Paul:	Hadn’t seen him in 55 years. Ron Paul:	From Oceanside. Said, “Do you remember who I – ” I said, “I remember the name.” Well sure enough, he needed a kidney transplant, was having trouble finding a place to get him to a transplant, I introduced him to Dr. Melancon, he had a kidney transplanted from his wife and he’s just doing incredibly well. Talk about a success story. Andy Ockershausen:	You connected the dots. Ron Paul:	That’s what it’s all about. That’s what it’s all about. Andy Ockershausen:	Well this is Our Town and we’re having a great conversation with Ron, and I’m gonna take a break here Ron, and then come back and talk to you more about Ron Paul. Announcer: You’re listening to Our Town with Andy Ockershausen, brought to you by Best Bark Communications. Andy Ockershausen:	This is Andy Ockershausen, Our Town, and having a conversation with Ron Paul, who’s one of the leaders in so many ways, and has done that in the banking business, and before that the real estate, but Eagle Bank is now 22 branches. I remember it when it was one, Ron, and everything starts at the beginning with one and then you’ve just grown. Now, what are your plans for the future for the bank? Andy Ockershausen:	All of your advertising, that is so important because I read em and it’s right there. The customer’s what we’re about. Ron Paul:	Yeah, our logo is “Relationships First”, and that’s what it’s about. It’s about relationships and I don’t care what part of your life, whether it’s banking, real estate, anything, restaurants, whatever you wanna talk about, it’s all about the relationship and that’s what we spend a lot of time focusing on. Andy Ockershausen:	Same with the kidney foundation. Andy Ockershausen:	Where did the name Eagle … Did you invent that … And the sign? I love the fact that it’s so strong. Eagle is a strong word. Andy Ockershausen:	… is our bird. Thank God. Andy Ockershausen:	But you do have plans for growth, of course, and you’re gonna continue in the Greater Washington area? Andy Ockershausen:	Billion, as in B.
Ron Paul:	Billion, as in B.
Andy Ockershausen:	What you have accomplished … But you’ve done it with competition and against competition, and now I see a lot of other people think that they’re private banks or what-are-they-called, where people bank, they all pick up on your theme, but you were there first. Ron Paul:	Andy, it’s all about the people. In anything you do, our relationship, it’s all about the people and Eagle Bank has 480 incredible people that I’m fortunate enough to work with and they are as passionate and visionary as the people that started the bank, and I’m just so grateful for all of them. Andy Ockershausen:	Well, one of the great pleasures has been for me, is to watch you grow because I know how important your relationship is with Bob Pincus, and I’ve watched that for years and years. Another Maryland boy, as we all are. Ron Paul:	Don’t hold that against me. Andy Ockershausen:	I’ve known Bobby since they ran that joint out in Bladensburg, or something. His father’s restaurant, Pincus Grill, and Bob was very instrumental in me being involved in the banking business. I learned so much from him, and I’ve watched him grow and I watched him … He was a big part of the community and I know he was a big help to you when you were really getting ready to grow. Ron Paul:	Absolutely. One of my mentors. Andy Ockershausen:	People. People! Pincus is a people guy. He took a lot of risk in the banking business, but he did it in a personal relationship and that always pays off, I believe. Personal relationships. Andy Ockershausen:	No, he knows I would put him away if I could. Janice Iacona Ockershausen:	Ron, right before we took the break you were gonna tell us a quick story. Andy Ockershausen:	You were saving lives. Ron Paul:	And we were saving lives. At the end of the day, that’s all we cared about. We didn’t care who was getting what from who, and it was the ultimate tear-jerker I’ve ever, ever experienced. Andy Ockershausen:	I can believe that. Ron Paul:	… were mentioning, the improvement to medicine is so phenomenal, so think about the gift that you can give on … I received a phone call just two weeks ago from a gentleman in Atlanta that happened to be seeing the Kidney Center Ad on TV, and called me, and he’s in the process of getting underwritten for a kidney transplant. Ron Paul:	… of the good we would do. Andy Ockershausen:	Now, has the public health service or the government of any help to you at all? The National government? Andy Ockershausen:	You’re incredible. You’re still playing a lot of golf, I know. Ron Paul:	Yeah, don’t embarrass me. Ron Paul:	Don’t ask me what my score. Janice Iacona Ockershausen:	Ron, I have a question regarding the technology and the future and the development of the 3D printers and using – Have you done any research or any knowledge of what’s happening with the creating new kidneys from your own stem cells? Andy Ockershausen:	Could be used. Ron Paul:	Yeah. So if you’re a perfect match in California and unfortunately there’s a death in DC, being able to get that kidney extracted and be able to transport it to California, is something that you need time with and that’s one of the things, along with like you say the 3D copying and the stem cell and all the different things, but … The key is awareness. We have to find out who needs kidneys. There’s thousands and thousands of people that need a kidney that don’t even know that they need kidneys. Ron Paul:	They’re time bombs. We’ve done a study, about 68% of the people that we’ve had come to an event, they do blood work, they do urine analysis, they do a variety of things, but 68% of them leave knowing that they had something that they didn’t know when they walked in the door, and it’s not just kidney issues. It could be heart, it could be . . .
Andy Ockershausen:	Yeah, they find a lot of things. Ron Paul:	But it just goes to show that we’re just not educated enough and we don’t take the time to find out exactly what we need to do for our own health. Andy Ockershausen:	And you’re a living example of that. You stumbled into saving your life. Ron Paul:	I am a living example, thank God for life insurance. Andy Ockershausen:	You also, in addition to being a banker and a real estate man, are a golfer. Also, you have a love affair with Deep Creek Lake. Is that not true? Ron Paul:	I do. That’s wonderful that you mentioned that. Don’t tell too many people that Andy, though, because it’s a little jewel. Andy Ockershausen:	I know it is! Ron Paul:	It’s a little jewel. Andy Ockershausen:	… traffic up there. Ron Paul:	Don’t tell them where Deep Creek Lake is. Ron Paul:	But it’s a little jewel that we’ve had a place up there for a number of years, and we have our family up there all the time and it’s just a special, special retreat for my family. Andy Ockershausen:	… I go way back with them. They’re wonderful people. Ron Paul:	I do, I have two wonderful girls that are married to wonderful guys and one of those guys and my daughter has a little beautiful baby that’s 10 months old. Ron Paul:	That’s just the absolute love of my life. Andy Ockershausen:	I know what that is. Ron Paul:	She’s got me wrapped around that finger in just 10 months. Andy Ockershausen:	You’re an incredible man with incredible life and the things that you and Joy have done are so important, and are gonna live forever, Ron. You and I may not, but what you’ve done is going to with the George Washington University I think. It’s great for Our Town. Ron Paul:	Well Andy, thank you very much for having me and I can’t tell you how much I appreciate it. Andy Ockershausen:	Well you know, you’re an icon and you’re not old enough to be one, but we think you are, and thank you for being on with us and thank you for staying in Our Town and thank you for Deep Creek Lake, and I won’t tell anybody how wonderful it is. Andy Ockershausen:	This has been Ron Paul, and this has been Andy Ockershausen, and this is Our Town. Announcer:	You’ve been listening to Our Town, Season three presented by GEICO, our hometown favorite. With your host, Andy Ockershausen. New Our Town episodes are released each Tuesday and Thursday. Drop us a line with your comments or suggestions, see us on Facebook, or visit our website at ourtowndc.com. Our special thanks to Ken Hunter, our technical director and WMAL Radio in Washington DC for hosting our podcast, and thanks to GEICO. 15 minutes can save you 15% or more on car insurance.